The Best World War I Story I Know: On the Point in the Argonne is the breath-taking story of three U.S. Army divisions tasked with capturing the Côte de Châtillon during the Meuse-Argonne offensive in autumn 1918. Readers will first follow in the footsteps of Missouri-Kansas Guard troops who were repulsed in the opening days of the battle; their courage in the face of heavy fire was not enough to overcome poor leadership. They were replaced by the 1st Division, the “best of the Regular Army”. This fine unit became physically and mentally exhausted after suffering horrendous casualties. Unable to fight on, “The Big Red One” was exchanged at the base of Côte de Châtillon, with the 42nd, the Rainbow Division. It too struggled to gain ground on the heavily-contested hill until General Douglas MacArthur’s determined 84th Brigade of “Alabama cotton pickers and Iowa corn growers” forced their way past the Germans. The Côte was finally in American hands and the war all but over. 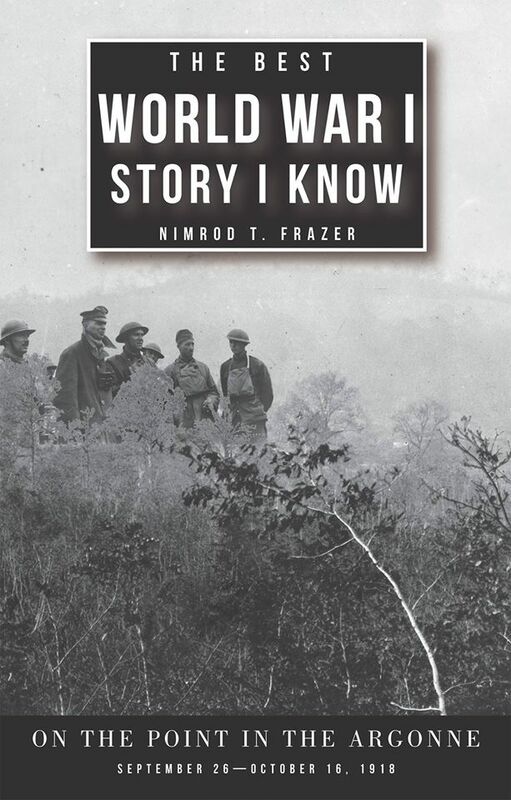 Nimrod T. Frazer was born in Montgomery, Alabama, to a family with a strong military tradition. Following in their footsteps, Frazer enlisted in the Army in 1950 and volunteered for Korea. Serving as a Tank Platoon Leader, he was awarded the Silver Star for Gallantry in Action. On returning to the United States, Frazer attended Columbia University and Harvard, receiving an MBA from Harvard. He engaged in a successful business career. Service to country and community were his main focus throughout life. In 2011, he erected a Memorial to the Rainbow Division and the 167th Infantry Regiment on the site of the battle of Croix Rouge Farm in France where his father received a Purple Heart. It honors all soldiers of the Rainbow Division who gave their lives on French battlefields during WWI. He has told their story in a book called Send the Alabamians, published in 2014 by the University of Alabama Press. In 2017, he gave the same over life size bronze sculpture, representing an American soldier carrying the body of his dead courage, a work by the British sculptor James Butler, R.A., to the city of Montgomery. In 2017, France made Frazer a Knight in the Order of the Legion of Honor. Read more about the WWI Centennial Argonne Commemoration Project.